I know many of you don't really care, but in exactly 15 days, it will be seven years since my oldest son (whom I never "abandoned" and raised with his father and three siblings until he went into the Army when he was 21), Casey was killed in this Empire's insane War OF Terror. Was Casey the first, or the last? No--but he was my first and the shock knocked me out of my quiet complacency--which was just as wrong as the Empire's unending wars. When I began protesting, Bush was president and my protest and the energy that grew around it was used by you Democrats to regain political power in the federal government. Four years later and a change of Executive, this nation is still mired in Arab countries waging a war against Arabs of all, or no, faith. Now brought to us by the Blue Team. Three days after the current evil Emperor was installed by the oligarchy, he ordered a drone bombing in Northern Pakistan (a country that we are supposedly not at war with) that killed 36 civilians and since then, he has been absolutely mad about drone bombings, increasing Bush's total over 300 percent in far fewer years. Even though I never supported Obama who funded wars as a Senator and who is NOT a peace president, I said at the time: "Three days in and already a war criminal." I was thoroughly attacked by Democrats who once affiliated as "peace" activists for not giving Obama "time." Well, Gitmo is still open, military tribunals will resume for men who have been illegally detained for up to a decade now, US Tomahawk missiles are raining down on innocents in Libya (killing people to save them is the NEW PEACE), dictators are still supported, Israel is still occupying and oppressing Palestine, activists are being targeted by Obama's DOJ while BushCo are being protected, the USA PATRIOT ACT was renewed, the Gulf is dying--and where is the outrage? This is where I think the outrage is--the oligarchy of this country is clever, they knew that it would take a person of color with an Islamic name who sold his soul many years ago--to fulfill the neocon agenda of planetary dominance (see: Project for a New American Century). So if one criticizes Obama, then we are attacked by War Loving Democrats for being: "divisive fanatics," "racist," "Tea Baggers," "crazy," etcetera. Could McCain be getting away with bombing North Africa? Or does that take an African-American to give political cover to the war jackals? The last four paragraphs were for War Loving Democrats, Greens and Socialists--yes I have heard from all three groups denouncing me for being against bombing Libyans to save them (same thing BushCo said about Iraqis, by the way--and the very same rhetoric used for Vietnam, etc). This next part is for war loving Republicans and "Independents,"
What? Are you people morons? First of all, you should be dancing in the streets praising the name of Obama like your comrades in the Democratic Party who hypocritically support his murders. Face it--YOU OVERTLY LOVE WAR--when a Republican is doing it. Admit it, you salivate over killing innocents so those "jihadist" babies won't crawl over here to cut your throats and make your women wear burkas! How dare you attack me and complain that I don't protest Obama's wars, when you should be out supporting him with all of your violent hearts and souls. Before you write to attack ME for being a hypocrite, I suggest a five minute exercise in "googling." If you do that, then you'll see since before he was even elected, I opposed Obama, while I was running for election in San Francisco AGAINST a Democrat, Nancy (War Lover and Torture Supporter) Pelosi. You'll also see that I wrote a book in January of 2009 detailing everything I discovered that was wrong with this Empire and the myths that bind both sides to the establishment. Then you'll find that I traveled to Martha's Vineyard in 2009 when the Obamas took a $50,000 per week vacation there to demand a meeting with him to ask him "What Noble Cause?" But that's not all, my War Loving Republican "friends." In March of 2010, I set up a Peace Camp called Camp Out Now on the lawn of the Washington Monument for two weeks protesting Obama and his wars. Near the end of that Camp, I was arrested in front of the White House and jailed for 52 hours, then given a four month "stay away" order from the White House--does this sound like someone who supports, or is supported by the Obama regime? Not being one to abandon my principles so quickly, I went back in July for two weeks to try and do the same thing. I have protested the regime's drone bombing campaign in front of CIA HQ in Langley, Va AND at the Smithsonian Institute where the harbingers of massacre are proudly displayed--I even traveled to Oslo, Norway to protest his awardence of the Nobel Peace Prize. So, War Lovers on the "right"--hate me if you will, but hate me because I am diametrically opposed to everything you stand for, not because I am a "hypocrite." Look inside yourselves and realize that Obama is ONE OF YOU--scary isn't it? And War Lovers from the "left"--hate me if you will, too, but not because I am a "fanatic" (how can one be a fanatic about non-violence? ), hate me because the light I shine back at you exposes your own lack of integrity around these issues--be honest and look deeply inside yourself and see that if it were McCain/Palin or Bush/Cheney bombing the crap out of Libya, you would be furious with me, not at me. 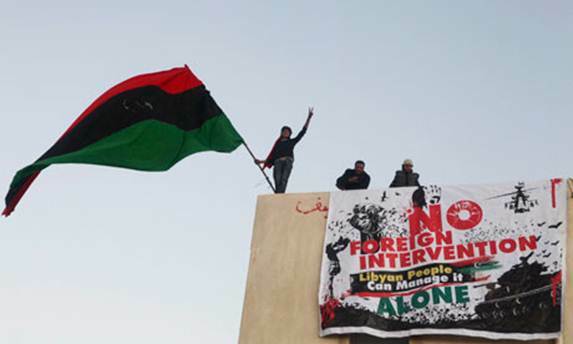 PS: Being against the US and its toadies bombing Libyans DOES NOT mean I am for Qaddafi killing Libyans either (or anyone killing Libyans, or others, for that matter). Bar and Mo sitting in a tree! You are completely right, Cindy and I respect that. Once, a long, long time ago I was registered as a Republican. G.W. drove me out of the "Party" and I have never been in A PARTY since that time. BOTH of the parties are in collusion. It is they (the party/oligarchs) who choose those for whom we vote, and what grand choices we get, eh? The only candidate I have voted for in the last several elections was Ron Paul. He was against PERPETUAL WARS FOR PROFIT and NON-INTERVENTIONISM. Since then, there has been no one who excites me. It is sad, but most of the Rs and Ds do not understand what you are saying. They vote for their party, right or wrong. They do not think! I am sad that more people do not understand what is happening. Not only have we lost thousands of military personnel and killed thousands of innocents in drone-bombings, we have thousands who are maimed and scared for life, IF they do not kill themselves. The suicide rate of veterans on a daily basis is abysmal. We should all be weeping for our troops. THANK YOU FOR YOUR STEADFAST PURSUIT OF PEACE. Obama is just another puppet in a long line of puppets. The thing about the current election cycle is that someone NOT CHOSEN by the oligarchs has captured the people's support --- he is NOT anyone I would have chosen, BUT it is certainly fun watching the NeoCons and the Dems scramble and spend MILLIONS OF DOLLARS to beat him. THEY BOTH (Rs & Ds) SHOW THEIR TRUE COLORS AS THEY BLATANTLY TRY TO PUBLICLY SHAME DONALD TRUMP! He is NOT their chosen one. IF only those of us who are for PEACE could gain Trump's ear ---- think of what might be gained. Just a thought. If you read Cindy's great letter about the warmongers on the left and right, you can understand why a progressive like me is voting for Donald Trump. At first it makes no sense, but when you see the similarity between these 2 war-loving parties, even a loud-mouthed fool like Donald Trump is an improvement.